Spadsere Granada's belyste gader på en natvandring. Vandre Albaicins glødende labyrint og lyt som din guide giver fængslende historisk sammenhæng og afslører kulturhemmeligheder. Se det overdådige Alhambra-paladskompleks badet i aftenlys og beundre luminescerende landemærker på vej til hulerne i Sacromonte. Hør om områdets flammende flamenco-traditioner, og nyd din gane med et udvalg af tapas og drikkevarer. Nyd en intim atmosfære på denne lille gruppe tur, hvor tal er begrænset til 12. Hils din guide på en central placering i katedralen kvartalet og start din tur med en omgivende tur gennem Albacin, et charmerende UNESCO-noteret kvarter hyldet som Granada historiske hjerte. Beundre grand Granada villaer med deres velplejede haver og elegante facader, og observere den særskilte mauriske indflydelse i dette hyggelige kvarter. Vidunderlige udsigt over det oplyste Alhambra-palads på sin bakketop i nærheden af ​​Albacin, så spadsere til Sacromonte's spændende huler. Oprindelig bebodd af spanske sigøjnere, er hulerne berømt for at opretholde feisty flamenco dancing. Værdsætter charmen og karakteren af ​​kvarteret og se det mørkede indre af huler hjem til natten flamenco demonstrationer. Efter din fortryllende udforskning af byen, stop ved en af ​​Granadas mest populære tapasbarer ved siden af ​​Plaza Nueva for at nyde et udvalg af spanske specialiteter; feast på en plade af lokale tapas og nyd finvin, øl eller en sodavand som du absorberer spisestuenes omgivende atmosfære. Bid din guide og gruppe farvel inden for baren, men lad dig blive mere og nyd flere spændende tapas. Never thought a walking tour would be this fun. Mar was exceptionally talented in this field and very patient with our neverending question about the historical events. She is the best and I would have happily asked to have her as our main and private tour guide for the AlHambra! Tour is quite long for what it is. While I enjoyed the “history” lesson part, I just did not see much during the tour (other than a city street) to warrant all that walking through cobblestoned streets. If I did this again, I would take the bus or cab to the mirador San Nicholas to get the sunset view of Alhambra and walk to dinner then a flamenco show in the area. Organisation parfaite ! une balade dans le quartier d'Albayzin qui fait découvrir la ville de Grenade et son histoire. UN guide attentionné qui répond à nos questions. Il est vrai que nous n'étions que 2 et que nous avons eu des conditions exceptionnelles. Worth every penny! Be prepared to walk, flat shoes required, I did it in flip flops which were fine, but avoid heals at all costs! This provided stunning views of the Alhambra and surrounding area at sunset and our guide was knowledgeable and kept the tour interesting from start to finish. The Granda evening walking tour is great way to get introduced to Granda and see some beautiful scenery. We really liked our guide Juan. He is very knowledgable and funny. It is quite a bit of walking up and down some hills, which we enjoyed. 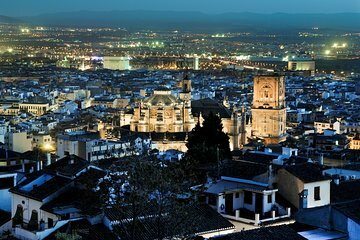 Granada has a fascinating history and is gorgeous in the evening. The views of the Alhambra at night are breathtaking. Interesting tour. Great opportunity for photos of Alhambra at night. This Tour is A must.Do Not Miss it. Excellent tour and a great way to get oriented to the beautiful city of Granada!. Beatrice was a gem and made our evening walk through Sacromante and the Albaicin districts all the more special. The tour finishes at a local bar where we were served an excellent TAPAS and a drink. I would highly recommend this tour!! pros , tour guide Mar was excellent. she did a great job explaining to all age groups. great for familes and couples. We shared this tour with 2 others may I recommend that you wear flat shoes with grip as it takes you over very uneven and hilly surfaces. Our guide was amazing and took us firstly up to the top of Granada's Gypsy cave area which provided magnificent views over the valley below and the Alhambra. The tour started at 8pm and as we wound our way through this fascinating area learning about the history of why the gypsies chose to settle here and about their unique cave dwellings, we were able to capture the most magnificant dusk photo's of the Alhambra. We slowly walked through a maze of narrow alley ways which gradually lead us down the steep hills where at times the space just opened up to a little plaza full of locals meeting up for drinks and food or just chatting and various eateries. Our guide provided much local information about the area and Granada and its history as he had grown up here, he spoke excellent English and was happy to take photo's for us. The tour took a couple of hours and finished with us at the base of the the walls of Alhambra and the old part of the town at a local bar for Tapas and a drink. We all thoroughly enjoyed this and all sat and chatted for another hour including our host whom delighted us with stories of Granada. I would recommend this tour to anyone wanting to really experience the öld partof Granada and the gypsy area as to do this on your own you would indeed get lost and miss some of the best parts that only a local can show you. Though you do need a degree of fitness we are in our early and mid 60s and feel persons whom are unstable on their feet would not be able to do this tour safely. Our guide was amazing and made the tour very enjoyable and feel this tour is a must do.